Paul F. Ellis Founder of: Short Run Swiss Inc. and Co-Founder Connector Contacts Inc.
1941 at age 9 his uncle gives him a shoe shine box and he’s in business for the first time. He earned $3 in his best weekend. At a nickel per shine, that was really hustling. 1952 Paul joins the navy and serves 2 terms. 1960 at the age of 28 Paul is honorably discharged from the Navy and shortly finds work for a major connector manufacturer in Southern California that machined what they call exotic materials. With his strong work ethic, Paul quickly works his way up as lead Setup Man overseeing 35 Swiss automatics. 1960 to 1966 Paul hones his skills working with all type of materials developing machine processes. and setting up/operating Swiss Automatic and 2nd operations. 1966 to 1968 in his garage Paul starts Glendora Cam Services. He started the business because he found that most companies really didn’t know how to setup and run Swiss Automatic efficiently and had little to no experience machining exotic materials. 1968 Using his well-honed work ethic and his skills working with all kinds’ of alloys Paul gets a loan and purchases his first Swiss Automatic and starts Short Run Swiss out of his garage. 1971 Short Run Swiss grows moves and incorporates. 1983 Paul’s son, Bud Ellis, starts working for Short Run Swiss Inc. at 16 on summer vacation machining contacts and other precision machined components. 1989 at 22 Bud is well versed in setting up and programming CNC Swiss and oversees all production operations. 1992 Paul Ellis semi retires and turns over all of the day to day operation to Bud Ellis. 2005 Bud Ellis along with his father Paul Ellis forms Connector Contacts Inc. Bud Ellis Founder of: Connector Contacts Inc.
2015 launches U.S. Swiss web site. 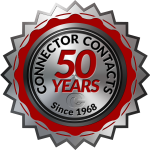 Presently: Connector Contacts continues to thrive in many diverse markets including Medical, Aerospace, Commercial and Defense.